The Wright Wreport: Feeling Fat, Bloated and Blue? Chew on These Morsels. Feeling Fat, Bloated and Blue? Chew on These Morsels. A stomach ache is a sign that something is amiss and should not be ignored. Photo courtesy of AATC of New England. “I feel bloated, blah and blue lately,” a good friend disclosed recently. We took a quick inventory of foods she’d been consuming lately. Typically, she’s great at incorporating a variety of fruits and vegetables with some animal protein into her diet, but this vacation week on Fire Island she was drinking Diet Coke. And her menstrual cycle was due. Boy, was she a mess! Ever have those days or periods, like my friend, during which you feel fat, bloated and blue? When no matter what you wear it will never do? Then you begin to wonder whether there is really anything you can do about it? Have you? Don’t fret or sweat because NYC Healthy Chick has got the skinny on what to do. 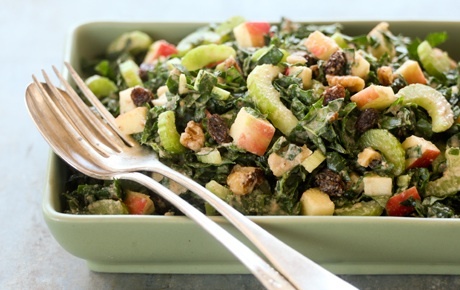 A take on the famous Waldorf salad using kale. Photo from Whole Foods Market. Listening to your body is key to optimal health and wellness. Being aware and mindful of daily food intake is important. This is the key to unlocking the mystery to how the body works. Over consumption of processed foods on a regular basis adversely affects the body’s internal systems – including digestion. In time, the body’s internal systems get clogged and stop working properly. The longterm effects contribute to the breakdown of the body, inviting disease and illness. One way to prevent this is to fast. My healthy lifestyle includes a regular juice-fasting protocol used by integrative medicine practitioners for cleansing and detoxification. It allows for optimal absorption of macro- and micro-nutrients while rebalancing the body. Considering this option? Be sure to do your homework to determine what works best. Whole Foods has a program worth investigating: http://www.bit.ly/q1hbuI. Food can be measured not only by nutrition but the experience it gives and the energy it creates in the body. In my friend’s case, we wanted her to feel lighter, brighter and flexible. My recommendations included leafy greens, quinoa, fruit, raw foods and chocolate. These foods help with insulin regulation, digestion, blood purification and alkalization of the body. The Blue Print Cleanse is popular among many who decide on a detox fast. Photo from Coolhunting. Diet Coke was also eliminated and identified as a culprit of her bloating since such beverages are loaded with chemicals and block absorption of key minerals in the body. I also recommended that she avoid sugar and caffeine and increase her water intake to 64 ounces a day. She started her new regimen immediately – during vacation. *Get at least 7 to 8 hours of sleep a night. Following are a couple of dishes to kick-start the eating program. We tried a new spin on an old classic. Instead of a traditional Waldorf Salad we gave it a whirl with kale (http://www.bit.ly/pZFmcP). Who knew a classic could have variety like this? 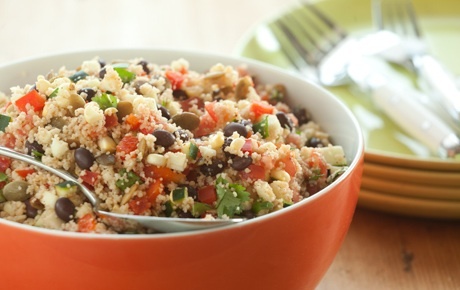 The grain-rich Southwestern couscous salad is filling but will not cause bloating. Photo from Whole Foods Market. The next time you are feeling fat, bloated and blue take a quick inventory of your food intake. Chances are your body is telling you to break out the greens and grains, drink plenty of water, and eliminate processed foods. 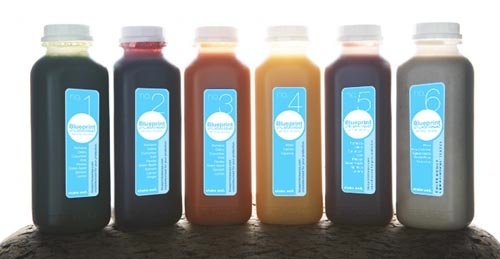 Or it might be time to take a break from food and do a little internal maintenance with a juice cleanse. Good lord, a slow day is good year for me and I don't (always) consider myself a hack. I honestly believe carp are most affected by the effect of moons abd tides the closer one is to a coast, as I've not noticed a difference. but did I say hack. To become fit you need to do exercise everyday. A trampoline can be your exercise tool. Because jumping on trampoline is a great exercise and it burs your calories. Find the best trampoline reviews from trmpolinesforyou.com.